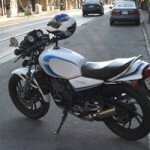 1981 Yamaha RD350LC for sale on Kijiji Toronto, ON. 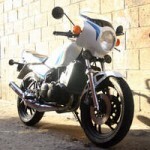 The RD was never sold in the US, although many made into the country from Canada. The ultimate hooligan bike: 2-stroke, lots of smoke, lots of wheelies, lots of tickets. I’m very biased on these bikes as I have an ’82. The RD is a great bike with all the great TZ-inspired features: 2 cylinder, 2-stroke, water cooled, monoshock, dual front discs. Most RD’s have had a very hard life but they all look fantastic from 10 feet away. It is the details that count. This particular bike looks tidy, with lots of new parts and those iconic Allspeed pipes. 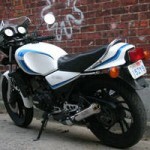 It is not stock, but has some tasteful modifications, for example the ’83 RZ350 fairing and powder coating. The bike is listed with 30,000 KM’s, which is high, so would advise checking with owner regarding crank re-builds and top end history. The cylinders have some fading, which suggest it hasn’t been apart in a while. If travelling a long distance to see this bike, consider asking for some detailed pictures before making the journey. .
Price is $4500 (CDN. ), which is a lot of money for this bike, but looks like the owner wasn’t shy about spending money on it. 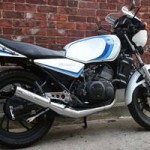 Next story 1981 Honda CB125S With 125 Original Miles!